question asked: Jun 01 '13, 8:42 a.m.
last updated: Jun 01 '13, 4:47 p.m.
Simon Eickel (1.1k●6●51●56) | asked Jun 01 '13, 8:42 a.m.
Is it possible to map two or more RTC components to one single folder in ClearCase? As I understand the Synchronizer and it's help this topic is not possible. We have a different structure in RTC as in CC. In RTC we have for each part of the product an own components. In RTC all of those parts are "member" of only one folder. If we now want to synchronize the RTC components to RTC we have to take the "parent folder" as subVOB component. When I do map the "CompI" from RTC to the "folder1" in CC the dir "CompI" will be synchronized with all the subdirs correctly on the correct place within CC. The question is now - am I able to set the "CompII" on the same folder within CC that the dir "CompII" can be synchronized correctly, too? 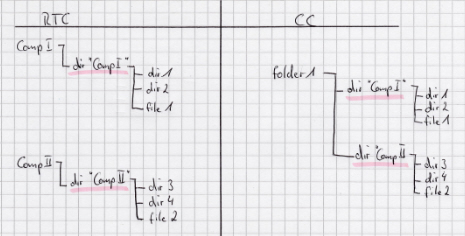 The problem when using the dirs "CompI" and "CompII" as synchronization roots within CC is, that the synchronizer will create a new structure as the Component itself is a folder within CC. Masabumi koinuma (461●1●5) | answered Jun 01 '13, 10:50 a.m. Does similar approach work for you in this case as well? Simon Eickel commented Jun 01 '13, 4:47 p.m.